There are people in the world who don't like sweet and salty together. I just don't understand. That's like saying you don't like kittens. But I guess these people do exist, and in my opinion, they just don't know what they're missing. 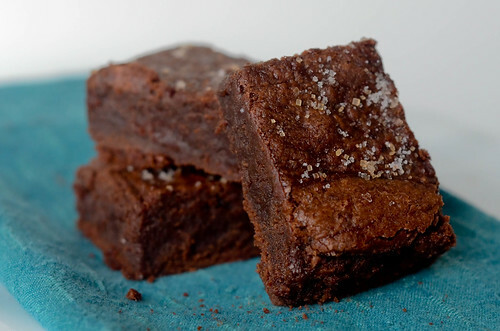 For those of you who do like sweet and salty, then these brownies are for you. They are the ultimate sweet and salty treat. You have two main components to this dessert - a thick, fudgy, dense and chewy brownie, and a homemade salted caramel sauce. Unlike these caramel brownies, these aren't so much caramel filled as they are caramel enhanced. It's not its own distinct layer - it just kind of melts in the rest of the brownie, leaving them incredibly moist and chewy, with that wonderful sweet and rich taste from the caramel. Sprinkle the tops of the brownies with a combination of fleur de sel and coarse sugar, and the sweet/salty combo is reinforced. And you're in heaven. I actually made these on a whim one rainy Sunday, and because the temptation to eat the entire pan was just too great, I sent them to work with Joey. He reported back that they were all gone by lunch, and a few people emailed him to tell him how delicious they were. I'd definitely call that a success! The recipe for the salted caramel makes more than you need for the brownies, but I trust that you can find something to do with it: eat it by spoonful, drizzle it over a brownie for extra caramel goodness, serve it with some ice cream.... or for the ultimate treat: Brownie - ice cream - caramel- whipped cream. Yes, yes, yes, and yes. To make the caramel, combine the sugar and corn syrup with 1/4 cup water in a medium saucepan. Carefully stir them together, trying not to splash the sides of the pan. Cook over high heat, stirring often, until the mixture reaches 350 degrees, about 6 to 8 minutes. It should be dark amber in color, but keep a close eye on it, as caramel goes from perfect to burnt and ruined in no time flat. Remove the caramel from heat, and carefully stir in the salt and cream. It will bubble up, so be ready! Whisk in the sour cream or Greek yogurt, and set aside to cool. To make the brownies, preheat the oven to 350 degrees and grease a 9x13 inch baking dish. Combine the butter and chocolate in a large microwave safe bowl and cook at 30 second intervals, stirring well in between, until the chocolate and butter have melted. Add both sugars and whisk until combined. Allow the mixture to cool to room temperature. Add three of the eggs and whisk until just combined. Whisk in the remaining two eggs, vanilla, and Kahlua, and whisk just until combined. To assemble the brownies, pour half the batter into the prepared baking dish. Drizzle 3/4 cup of the caramel over the brownie batter, being careful not to let the sauce come into contact with the edge of dish. Use and offset spatula to gently spread the caramel evenly over the brownie layer, then drop the remaining brownie batter over the caramel. Again, use the offset spatula to gently spread it in an even layer. Bake the brownies for 30 minutes, rotating the pan halfway through baking. The brownies are done when a toothpick inserted into the center comes out with just a few crumbs attached. Remove the brownies from the oven and sprinkle with the salt and sugar Cool completely before cutting and serving. Ooh, I love this idea with the caramel sauce mixed in! Plus we recently had some salted brownies at a party and Andrea insisted that I recreate them. This looks like a great starting place! PS - Once again, we're on the same wavelength with salted caramel today. Ha! These look so moist and wonderful! I have problems with brownies...I can never seem to stop eating them!! What I great idea to mix sugar and salt on top! These look delicious! Sweet and salty is the greatest thing ever. Hands down. One time I had a piece of salted CHOCOLATE caramel. And my life was never the same. I just made them! It is torture waiting for them to cool to cut! Mmmmmmm!! I love caramel brownies! Love the recipe!! Not gonna lie, in my opinion, these brownies are THE brownies. No other will ever beat them. These brownies look fabulous! Sweet + salty is a perfect combination. These brownies look amazing! My newest thing is salted caramel! I love these brownies!! I love sweet and salty! Especially when brownies are involved.